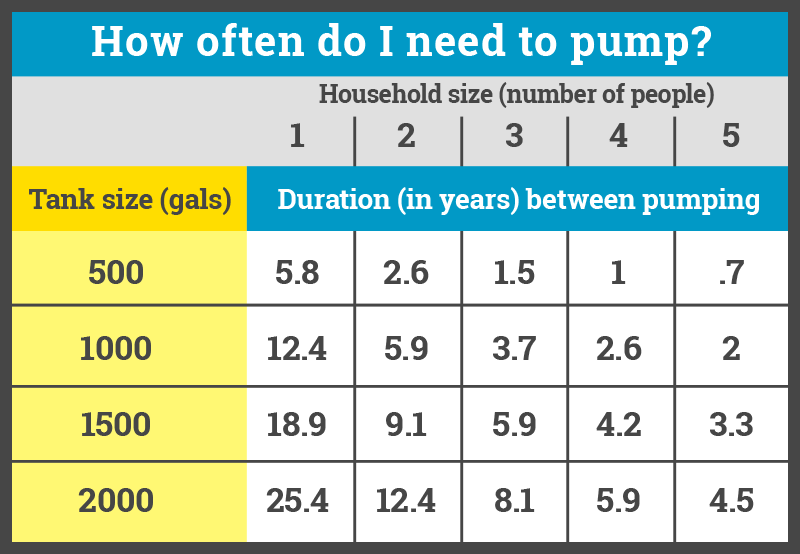 Here is a helpful graph that shows the approximate duration of time in which you should have your septic tank pumped. This is NOT to be ignored. 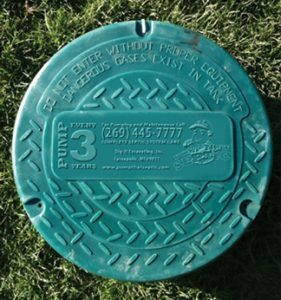 Not pumping your septic tank regularly can cause septic system failure. There are a number of different septic systems, each with its own design. Here is a conventional system. It consists of three main parts: the septic tank, the drain field, and the soil beneath the drain field. Septic Tank that is pumped regularly. Good water flow into septic tank, and good flow out to drain. 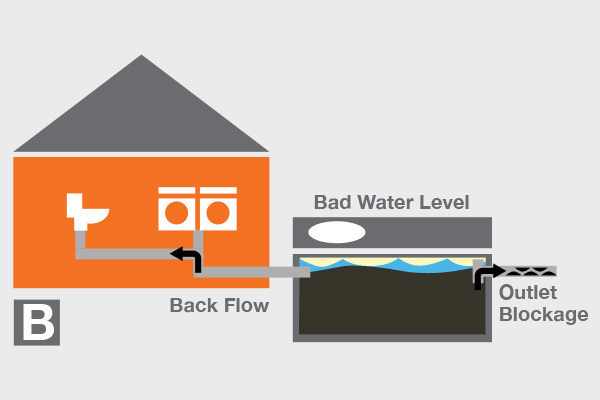 The tank level is below the inlet pipe allowing the toilet drain to have good clear flow. Septic Tank that Has been neglected. Restricted water flow into septic tank, outlet blockage and solids being pushed out to drain. The tank level is above the inlet pipe causing the toilet drain to gurgle and not flush properly. Yearly inspect filter and pump your tank as necessary. Do not do all your laundry washing on the same day, but spread over a couple days. High water usage will stir up your septic tank, disturbing the settling process and push solids out into drainage area, or prematurely clogging effluent filter. Do not dispose of household hazardous wastes, plastics or anything anti-bacterial in sinks or toilet. Only plant grass over your drain field. The roots from trees and shrubs can damage and clog the drain field. Do not place small buildings over any part of your system. Do not drive or park any car or other heavy vehicle over your drain field. Tired of digging up your yard every time your septic tank is cleaned? We can install a riser with a sealed lid that provides ground-level access to your tank for inspection and pumping. It is also a good visual reminder of the need to maintain your septic tank through pumping. 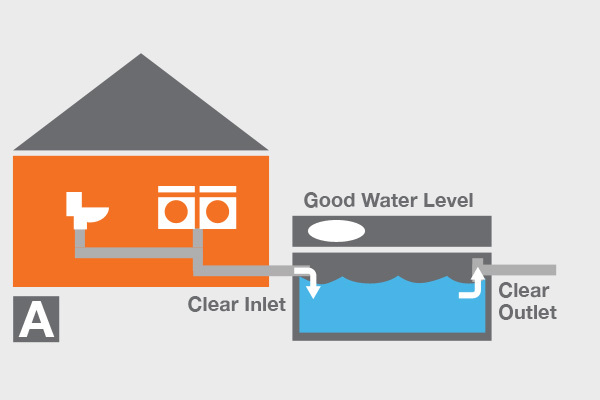 What is an effluent filter? Effluent Filters are designed to extend the life of your septic system by preventing solids from leaving the septic tank. These filters should be inspected and cleaned once a year. Having an effluent filter often will alert the homeowner of a problem in the septic system before it becomes a serious issue. If filters are not cleaned regularly they will cause drains to work in an unsatisfactory manner. • Additives replace the bacteria killed by many household cleaners used in every home, every day. • Additives help reverse any clogging trend in the soil absorption area. • CCLS has the broadest spectrum and highest count of organisms in the industry. 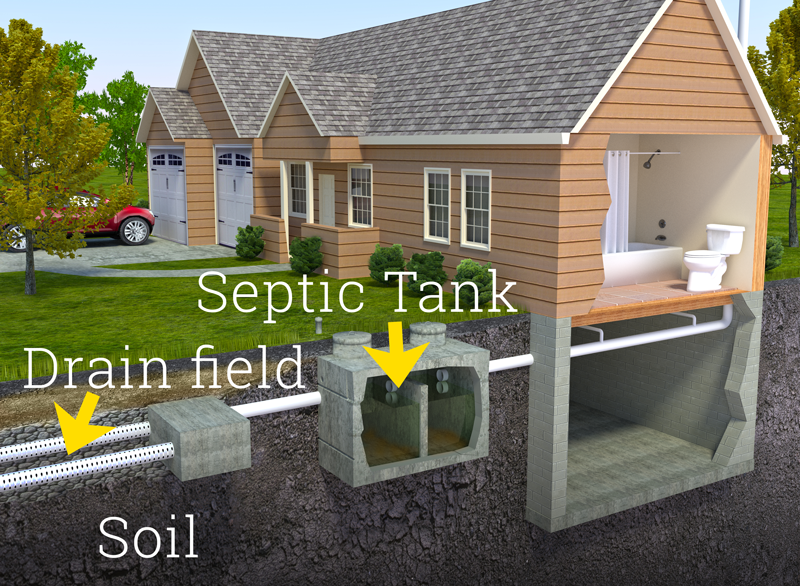 HOW IT WORKS: Bacteria in your septic tank break down organic solid materials. The enzymes in this additive feed the bacteria aiding in the cycle of digesting the solids. Used to aid proper septic tank function. HOW IT WORKS: AfterShock becomes active in liquid. When introduced into a soil absorption area, AfterShock will restore drainage by biologically digesting the solid material that normally clogs systems. Used as a cost-effective process of jetting/restoring a failed drainage system compared to the cost of a complete system replacement. degradation process. Used in drains where there is a concentration and buildup of grease. Adamsville, Baroda, Benton township, Berrien center, Berrien springs, Bridgman, Buchanan, Cassopolis, Constantine, Decatur, Dowagiac, Eau Claire, Edwardsburg, Galien, Gobles, Jones, Lawton, Marcellus, Michiana, Niles, Niles Township, Paw Paw, Pokagon, Schoolcraft, Sister Lakes, Stevensville, Three Rivers, Union, Vandalia, Watervliet, White Pigeon, Cass county, Berrien county, St. Joseph county, Van Buren county in Michigan. Pump That Septic is a subsidiary of Dig-It Excavating.